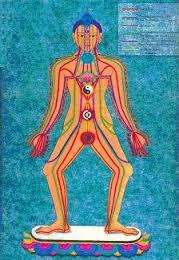 our bodies have meridians or sen lines of energy that flow throughout. Thai Bodywork, also called Thai Yoga Massage also helps the body release stuck energy. It does this through Nuad Boran or "touch with the intention of healing." 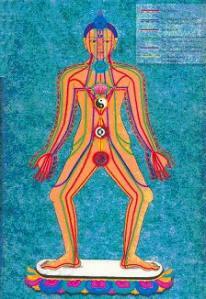 With acupressure, stimulation, and manipulation of energy lines, and marma points, energy moves. Marma points are special acupressure points that are vortexes of energy and when pressed, allow healing to come to the body. It is like this as a metaphor: Streams of water on the Earth that get clogged with sticks. When we clear away the sticks and the water flows faster and clean and clear throughout. Our bodies are the same and not only does Thai Bodywork on the physical body but also the energy bodies surrounding the body. It is a meditative art both for the receiver and the giver. Thus yoga moves stuck energy and you feel better with less pain as does Thai Bodywork, except it is passive. Bodywork is more than a relaxation tool to feel good. Bodywork in Thailand is passed down in the family and is considered a necessity for wellness, as a regular thing which family members can offer one another. Our culture is less touch based and doesn't see massage as an essential for feeling good all the time. We go get a massage when we are in pain. What if more people knew how to do bodywork and we had the time and energy to exchange it? I dream of a world like that. What if more people could receive bodywork as a way of staying well, not just to fix something? 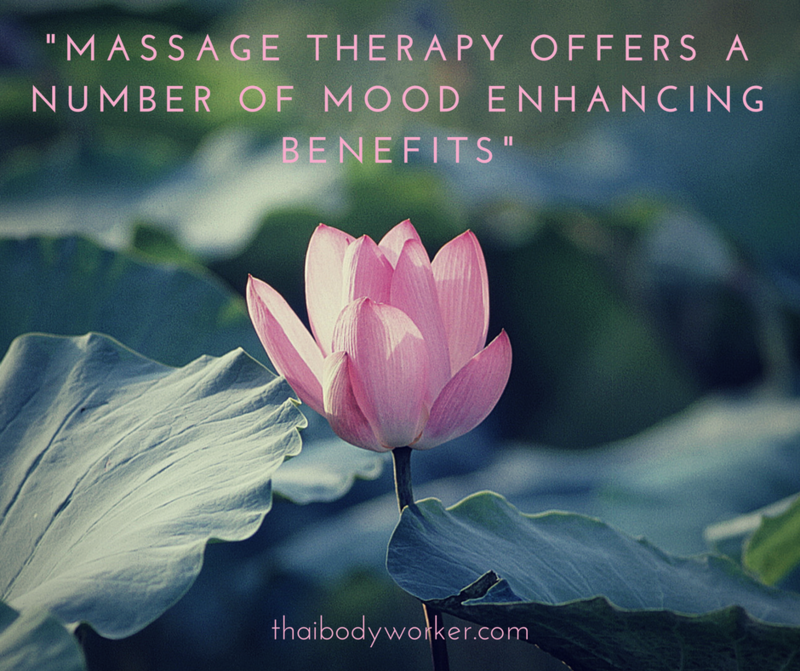 It not only improves your health and reduces pain, it puts you in a better mood to get a massage. You find your softness, ease and gentleness in approaching the world. You are able to embrace life with a smile and flow more. A bodywork session is an excavation into the self because our body has messages for us. When I receive a session, I realize places that are tight or have stuck energy that I didn't even realize. Once we relax, we open up to really feeling what is going on. Then we can ask questions like "When did this sensation or pain first occur?" "What does my body require of me to feel better?" Every sensation and pain in our body has an emotional component as well as an energetic and physical component. We can ask a place in our body “ What is the emotion associated with this?” From there, we may be able to acknowledge and then release the emotion and thus the tightness, pain or sensation in our body and feel freer. It is my sense energy flow and emotional flow all contribute to our body's well being. Thai bodywork unblocks meridians ( lines one energy) that run through the body. Thai bodywork is a collaboration between the recipient and their body and the work of the practitioner. Of course, it doesn't have to be hard work. It can be relaxing and relieving to simply receive. Bodywork seems to help us get in touch with the emotions and the body, our inner self, especially if we inquire within. After you get a session, you can journal and ask yourself what your body needs, when did you first feel this something in your body, and what is the cause of it? What does your body need to be at feeling its best? You may get images or messages while you are receiving. Bodywork puts me in an expanded, multidimensional state where I can access information beyond the usual realm as I am tuned inward. It shifts me to feeling better and more awareness. Awareness about our emotions and bodies is what we need to be healthy. A basis for this awareness is touch. Let's create a safe touch based culture of giving and receiving. Every person deserves the tender caring that is through bodywork and massage. Thai Massage comes Buddhist lineage, passed down in India and Thailand through monasteries as a modality of healing. How does Thai Massage work? It effects on the physical and energetic layers of the body bringing a person into greater well-being on all levels. Speaking of the energetic layers, they are called the koshas in Thai Massage which are sheaths that lie beyond the physical body yet include the physical body as one of the koshas. Through touch, with a variety of pressures from deep to gentle, the energetic knots and stuckness is released. Each of the energetic bodies are cleared through the bodywork. These koshas are like layers of the onion of your physical body, or like Russian dolls that are nested within each other. Your physical body is called the Annamya Kosha. Practitioners of Thai Massage work on the physical body which allows for a release of a person's pain while it conveys more flexibility in a direct manner of acupressure and other moves. Thai Massage, like yoga practice, works on the subtle bodies (koshas) around the physical body. The energy body, the Pranamaya Kosha is the next layer beyond the physical. Your body is filled with invisible channels of energy, and this is the layer of the 72,000 channels of energy or Nadis. This is where the stuckness can be worked out and released within you. When this layer comes into balance, it improves the energy flow and increases your life force energy so that our health improves. We feel more alive and invigorated after a massage, specifically Thai Massage. The next Kosha, Layer 3 is the Manomaya kosha, or the mental body. The effect of Thai Massage on this layer is about mental clarity and a feeling of emotional well-being. This is the part of us that allows us to take care of our needs and also helps us take care of others too. For those of us that are mind oriented, we may have mental chatter and also anxiety when this layer is out of balance. Thai Bodywork helps us take the anxiety down a notch or two, the level of anxiety that we carry, so that we feel better and more relaxed and capable of managing our lives, plus we are pervaded with a feeling of inner peace. and the support from everything. The other 3 bodies mentioned before come into balance and then this body comes into balance. We can move from a feeling of struggle for survival to a feeling of thriving in which we feel greater compassion, love and joy. The Wisdom Body helps us feel fulfillment and joy in our lives and relationships with others. Next, the final outer layer subtle body is the Anandamaya kosha is the Bliss Body. This takes us to a feeling of all pervasive oneness. This is the highest level in which we recognize our oneness with all that is fully. Working with the energetic bodies is to release residue of imprints of what holds us back that we may carry. 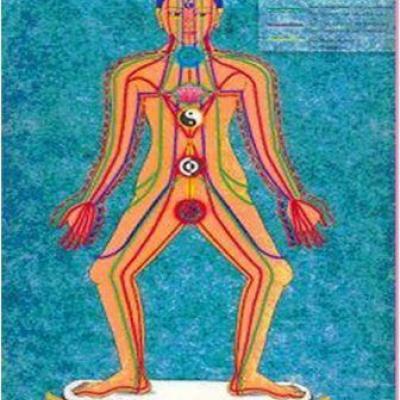 Acupressure in Thai Bodywork, the stretches, the work on Marma points (special acupressure points that are Nadis, or swirling energy vortexes) and the customized sequence for the person receiving clears out the layers so energy moves freely. This process of working with the bodily layers through yoga and also Thai Bodywork may stir up the old memories, both positive and negative, as they come to the surface for release. You could say Thai Bodywork is a spiritual catalyst. It could be experienced as an energetic cleansing on levels of emotional, mental and physical. Old energy forms are released so these energetic bodies, sheaths, or koshas come into balance. Each level creates more freedom for the person receiving through their own work in releasing. It happens in a way may bring up emotions temporarily but feels good to experience and leaves one in a peaceful, integrated state of well-being. I wanted to share how Thai Bodywork is not just a physical massage that is anatomically based. It is beyond that,yet includes the "feel good" and the pain relief of traditional massage. Or you might say that Thai Massage is the traditional massage as it has been around for a couple thousand years. The pure potential of Thai Massage is healing andalso spiritual transformation through clearing and balancing channels and the subtle and physical energy bodies. Let this be an invitation to check it out for yourself! ​What I love about giving Thai Massage is seeing person I am working on shift in a couple of ways. One is that they come in more serious or neutral in mood and affect, and that they sometimes leave laughing or giggling. I have seen this the with the last two people I worked on. I find that I am more giggly and light feeling inside. The other advantage to Thai Massage is that people tend to get floaty and relaxed. I attribute this to the whole of the work and also the ending, which begins with the feet moving up to the head. Working on the feet seems important as it starts to send healing energy to those places that people have more tension, their problem areas. The areas start to loosen up with therapeutic reflexology. That is furthered with working on the leg lines in Thai Massage, which are specific on each leg, for different aspects of the mind/body. I use palming with my hands and thumbing with my thumbs on these lines and I tune into the person to find out what pressure is best for them inviting communication on the matter. Then I open up the joints with some stretching and palming legs. There is bellywork that is deeply grounding. I spend time on the back, neck and shoulders while the person is sidelying or on their belly, depending on what they need and how they need it. Arms and hands get attention. I have discovered some special ways of dealing with elbows, forearms and hands for guitar players, computer users, and those with arm issues. I may add some shea butter to feet or hands during the massage work in these areas. The end included neck, shoulders, gentle work on the face. People also get really floaty and relaxed with the ending which is using specific Access Bars energy points which are held on the head. This is to release files of thoughts that are no longer needed within the mind. It feels relaxing and sometimes people fall asleep for a bit, or check out and then come back feeling great. There is often visible relaxation in their face, a smile and sometimes giggling. I love to see the shift from serious to smiling! Doesn't it make you tired? No. People wonder if I feel tired from Thai Massage or am depleted by it. The truth is that I feel better. For Thai Massage uses moves that are based on leverage and I don't really use your muscles as much to apply pressure with strength, though there is pressure in the massage for those who want it! It is more a pouring of weight that is gradual. I use my hands, elbows, feet, toes, knee, and forearm to apply pressure or strech a person. The mechanics of giving Thai Massage are based on using alignment and rocking providing leverage instead of hard work and strain for me. It is like yoga, in that it is a practice to make you flexible and it is based on how you stack your body in a way that is easy and effortless. The other thing I love about Thai Massage is that I am receiving a relaxation experience when I work on another. I relax as the person relaxes and at the end I am more chilled out, less anxious and more happy than when I began, just like my clients and friends. How lucky am I to experience this in the work that I do! The thing I love most about Thai Massage is to receive it because it feels great! Below are some places for those who are visitors in and around Mt.Shasta that I love. I made a card that lists them that is available around Mt.Shasta at some businesses and the Vistor's Center on Pine and Lake Street. I love these places, and I love that Mt.Shasta has so much beauty and many places to hike, and that feel really wonderful energetically. 1. Mt. Shasta, the mountain. Go to where you are called to stop and explore! 2. Headwaters at City Park. Off of North Mt. Shasta Blvd, across from the Human Society that is being rebuilt. This place has a playground, picnic tables, a field and a gazebo. It is where people bring their water containers to get the spring water at the headwaters. The river has beautiful green plants next to it along with trails to explore. It is a place where people hang out and enjoy especially in nice weather. 3. Mt. Shasta Gateway Peace Garden: has a lavender labyrinth, statues of the spiritual beings, flowers, a peace pole. You can tie a peace prayer flag (strip of cloth) that you write or draw on with your message. 8. 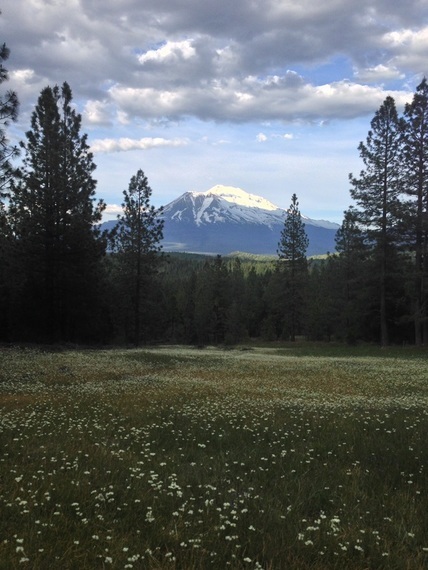 Sisson Meadow ( behind library)- flowers in springtime, birds, views of the mountain and Black Butte. Right in town. 9. Castle Crags in Dunsmuir (huge rock formations, hiking trails)- south of town, a park with lots of amenities such as trails and campling, and view of a monolithic rock formation. 10. McCloud Falls- north of Mt.Shasta City, with camping. Great place to cool off in the water! There are other waterfalls in the area such as Hedge Creek in Dunsmuir. PS: I have discovered a new place to visit called Fairy Falls, at Ney Springs near Lake Siskiyou on the road up to Castle Lake. This road is on the left pretty soon as you go up the road. take it until there are two roads that fork side by side and a dirt parking area. Walk up the road, and go half an hour. 3 trails are off the rocky road you hike upward. There are three piles of stones on the third one and that is where the most splendid falls are. It is really lush and green and shady in this area. You will love it! What are the Thai Lines? The body has meridians of energy flow, just like the Earth does. On the Earth, the lines are called ley lines. On the body they are called Sen lines. Through the practice of Thai Massage, these imaginary lines on the body are palpated with acupressure treatment to release energy blockage in the physical body and energy bodies. My teacher, Ariela Grodner, describes like this: your body had rivers of energy and there may be areas where sticks or debris collect and a blockage in your flow results. Have you seen this in a stream? Imagine clearing those places out. This is what the line work does! This means less energy for you in the physical and also your other bodies. A goal of Thai Massage or Bodywork is to clear the physical and each of the layers of the body. In Thai Massage, which is an ancient healing system from the time of the Buddha, the body is seen as being the earth layer. The layers of energetic bodies relate to elements from earth to ether. The balancing and integration of these layers with their energetic clearing allows us to feel the Anandamaya Kosha, or the bliss body. This is our connection to our natural self, which is complete whole and blissful, and with the realization of oneness with our divine self Aside from bringing us physical well-being, Thai Massage brings us to wholeness and wellness in our emotional body, our energy body, our wisdom body as well. The way the lines function is as a means to trace important meridians with healing intention. Different lines have special therapeutic application and in fact, Thai Massage is a complete healing system. It is more than something to help you relax, though you will receive that too. The derivation of the line system is from the Ayurvedic realm. "The lines when woven together and taken as a whole, become a map to be used as a means of maintaining a conscious presence while tuning into a higher vibration." The Thai Practice of tracing these energetic sen lines is powerful and adds depth to Thai Massage. We often start working on the feet (that have sen lines that reflex to the whole body) and then the leg lines which prepares the body for receiving the rest of the work on the rest of the body. It opens up the energy channels, balances these koshas (layers I was speaking of) and then by the time the part of the body, say the back, is touched, it will easily let go of tension in the stiff place or area with pain. Acupressure on the Sen Lines in Thai Bodywork is one thing that is part of the treatment. We also work on marma points which are special points that unblock and move energy on the body. There are stretches, palming, holding, gently stroking, in many ways that make the experience of Thai versatile and interesting, yet therapeutic. They call it "Lazy Man's Yoga" for moves that open your body into yoga poses, yet it is done for you and feels easy instead of having to do the yoga. And you don't have to be a yoga practitioner to benefit from Thai Bodywork. Elders, pregnant women, and athletes and others can find relief in a customized way for their body type. I hope this gives you a bit of an understanding of the lines in Thai Bodywork which are similar but different from lines used in Shiatsu, which is a similar modality. Feel free to come in for a Thai Session and try it out. I wanted to share a tip for empaths, and other energy sensitive people. Mt.Shasta is a high energy vortex so the people here tend to be energetically sensitive whether residents or visitors. What if you are a person who holds a lot in your muscles? Or perhaps you hold a lot of emotions, maybe some you picked up from those around you? So many of us take on the energy of others as ourselves. Sometimes we don't realize that we are absorbing what is around us and processing it as if it happened to us. Workplaces or conversations or homes with others could mean that we may unconsciously take on the thoughts and emotions of others. This could turn into blocked energy in our bodies which becomes stuck as knots or tension of the muscles. A way to become unstuck is to ask, whenever a feeling comes up, a question. Ask the question "Is this mine?" for everything you feel emotionally. Try it for a day and see what happens. The same for your body. Your conscious breath also helps your release. I suggested this to a Thai Massage client recently with great results. She was able to release lots of tension she was carrying. She could also see how she could be different at work around people with their fears, which she realized she has been taking on but does not need to, as it is not hers! This was huge for her and helped her in the session as she kept asking the question while she felt her body let go in those special spots that were holding something. Ask yourself "Is it mine?" And you will be surprised how much emotion and tension will simply disappear when you tell yourself no in answer to the question. The good news, for energetically sensitive people is that they are able to shift how they feel and really let go in a massage session. Energetically sensitive people can really tell what is going on in their bodies and be conscious of it, plus release a lot of what they may be carrying emotionally and physically. Keep in mind that emotions create how the physical body feels, the basis of your health and well being, so addressing both physical and emotional is a good idea. We are all energy, and the body is energy solidified into form. Remember you are mutable and everything is changeable because it is energy.